McClain’s Brianna Weller drives baseline against East Clinton’s Kaitlin Durbin on Wednesday at McClain High School where the Lady Tigers hosted the Lady Astros in a non-conference girls varsity basketball contest. Kyla Burchett goes up for a layup for the Lady Tigers on Wednesday evening at McClain High School as two Lady Astros defenders, Kaitlin Durbin and Gracie Boggs, attempt to contest the shot. 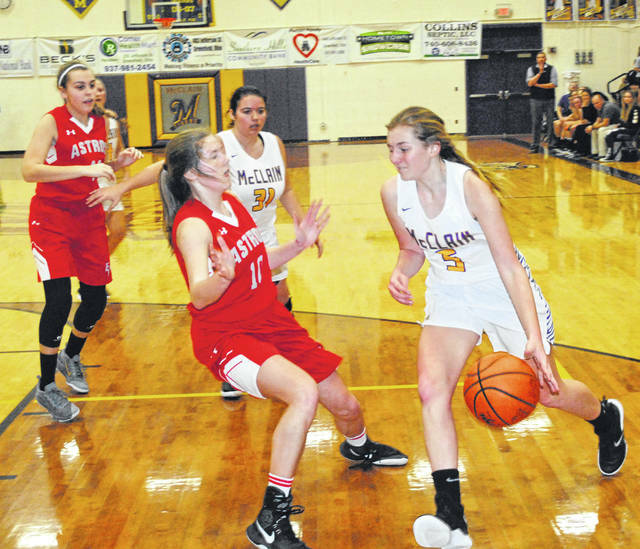 GREENFIELD — On Wednesday, for the first time in nearly two weeks, the Lady Tigers of McClain took the court when they hosted the East Clinton Lady Astros in a non-conference renewal of a rivalry between two former members of the now defunct South Central Ohio League. McClain used strong starts to both halves of play and registered its tenth win of the season by a final score of 54-44. The Lady Astros started strong and briefly took a 4-0 lead thanks to baskets by Makenzie Campbell and Kaitlin Durbin and a defensive effort that held the Lady Tigers scoreless for nearly two minutes to open the game. Kyla Burchett hit a three with 6:10 to go to get the Lady Tigers within a point before East Clinton’s Lacey Peterman got one to drop making it 6-3 early in the first. Jaelyn Pitzer tied the game with 4:09 to play in the first quarter when she hit a three pointer of her own to spark an 11-0 run. Burchett recorded four points during the run while Kelli Uhrig and Bryn Karnes each had two points to help McClain turn a one point deficit into an eight point lead in just over two minutes of play. The Lady Astros reeled off four quick points as Cambell found the bottom of the net and Durbin sank two free throws to cut the McClain lead to four with 1:06 to play. Kyla Burchett finished off the quarter for the Lady Tigers with another bucket as she finished with nine of her game high 20 points in the first and gave McClain a 16-10 lead heading into the second. 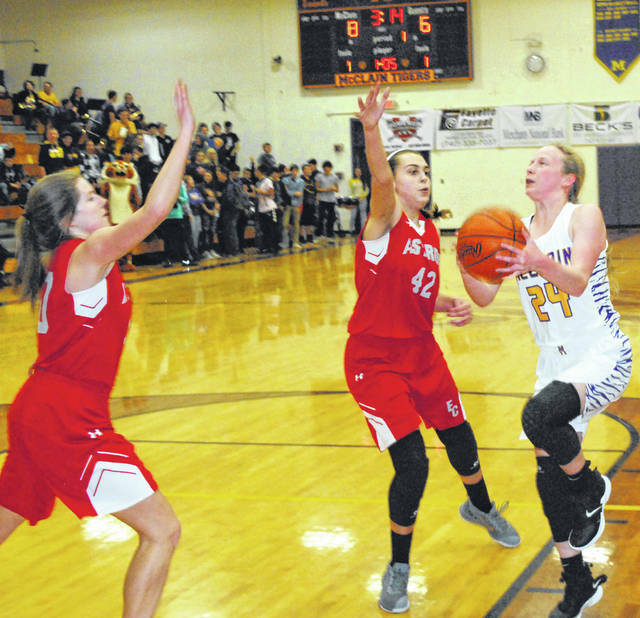 The Lady Astros proved resilient in the second quarter after the Lady Tigers extended their lead back to seven points at 21-14 on a basket by Uhrig and East Clinton finished the quarter with a 7-4 advantage to only trail by four at halftime with the scoreboard reading 25-21 in favor of the Lady Tigers. East Clinton continued its strong play in the third quarter when they got two within one point at 31-30 on a basket by Peterman that forced McClain Head Coach Jarrod Haines to call time out with 3:59 to play in the third. The Lady Tigers responded following the timeout as Pitzer hit back to back triples to spark a 14-5 run to end the quarter that also included six points from Karnes and two from Burchett to push the Lady Tigers’ lead to 10 points at 45-35 with one quarter left to play. The fourth quarter was a dead heat between the two teams as the defense picked up on both sides of the court as the teams combined for only one field goal attempt over the final 3:50. McClain struggled to hit free throws down the stretch but their defense was able to keep the Lady Astros in check. East Clinton combined to go four out of eight at the charity stripe down the stretch as McClain held on to win 54-44. McClain will be back in action on Saturday, January 26, when they host Nelsonville-York in a non-conference matchup.